99% of all cases of domestic violence involve financial abuse, an invisible weapon keeping victims trapped in or returning to abusive relationships. We recently had the opportunity to speak with Vicky Dinges, Senior Vice President, Corporate Responsibility at Allstate. Allstate Foundation Purple Purse is aimed at creating long-term safety and security for survivors through financial empowerment. Read on to learn more about the program. Question: Why did Allstate and The Allstate Foundation get involved in addressing the issue of domestic violence? Domestic violence has reached epidemic levels in our country and is having severely detrimental effects on public safety, public health and the U.S. economy. Anyone who doesn’t think they know someone who’s a victim of domestic violence is incorrect. 1 in 4 women will experience domestic violence in her lifetime – that’s more than all the women who are affected by breast cancer, lung cancer and ovarian cancer combined. They are our sisters, our neighbors, our coworkers and our friends. Thirteen years ago, when The Allstate Foundation studied the domestic violence epidemic, we learned an abuser’s need for power and control often goes beyond physical, sexual and emotional tactics to include financial abuse. In fact, financial abuse occurs in 99 percent of all domestic violence cases and can have nearly as long of a lasting effect on a survivor as physical, sexual and emotional abuse. It can take decades for a survivor to rebuild ruined credit and dig out of crushing debt. And, it’s one of the top reasons victims “don’t just leave” an abusive relationship. Once the Trustees of The Allstate Foundation learned about the pervasiveness of domestic violence and the devastation caused by financial abuse, they couldn’t turn away. 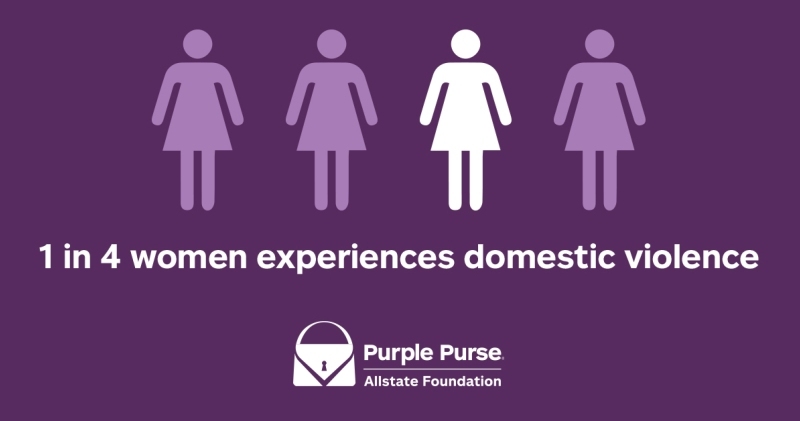 We began our commitment and created the Allstate Foundation Purple Purse program to directly address the issue of financial abuse in domestic violence relationships. Using our financial expertise as an insurance company, Allstate and The Allstate Foundation empower survivors to see and achieve a better and safer future free from financial deprivation. Q: How has Allstate Foundation Purple Purse evolved over the last thirteen years? When we first started in 2005, Allstate Foundation Purple Purse focused on working with state domestic violence coalitions and local nonprofits to add financial empowerment tools to their core services. This includes our free comprehensive financial empowerment curriculum – available in English and Spanish – that we developed with our partner the National Network to End Domestic Violence (NNEDV). Since then, we’ve trained 11,000 domestic violence advocates from over 1,600 nonprofits in all 50 states to teach our academically validated, best-in-class curriculum. Through this work, we’ve seen transformations occur within organizations and in the lives of the survivors served. We’re proud to share we’ve now invested more than $60 million and propelled more than 1.3 million survivors to recover their financial independence and break the cycle of abuse. Over time, we also expanded the focus of Allstate Foundation Purple Purse beyond grant making and financial empowerment programming to include thought leadership and public awareness campaigns. We’ve led the way in bringing domestic violence out of the shadows on several fronts. When our public awareness campaign began, we had to hide messages and resources about domestic violence on a website disguised as an online fashion magazine to safely help survivors. Now, we work with strong and popular celebrities to put our message of empowerment front and center at impactful forums, such as the United State of Women Summit, through fashion, financial and sports media outlets and to millions of social media followers. And, each year we create new and provocative campaign content that helps make the invisible weapon of financial abuse visible and gives the public the inspiration and tools they need to take action and show empathetic support. More importantly though, we’ve helped give survivors a safe way out from abuse. In recent years, we’ve seen more survivors speak up and reach out for help, only to find their local nonprofit unable to address their requests and pleas. Nonprofits want to help, but they’re enduring a severe lack of funding for critical services for victims and their families. Once we learned of the local nonprofits’ resource challenges, we knew we had to do something. Helping domestic violence nonprofits raise funds became one of our top priorities. Five years ago, we created the annual Purple Purse Challenge, our friendly online fundraising competition, as the crowdfunding movement started to gain momentum. Since we started the Challenge, we’re driven to keep raising the bar. We’ve increased monetary incentives for nonprofits, given donors chances to win exclusive prizes, such as our celebrity-designed purple purses, and created year-round opportunities for supporters to help nonprofits raise millions in critical funding. I’m extremely proud of last year’s Challenge where 220 nonprofits participated and raised $3.7 million during National Domestic Violence Awareness Month in October, but I know we’ll reach even higher this year! Q: How does The Allstate Foundation engage Allstate employees with the program? What steps are taken to maximize participation? Allstate employees and the agency force are our best ambassadors for the Purple Purse program. Their efforts help bring our programming to life at Allstate’s offices, in local communities and through their social networks. To maximize the participation and involvement of our agency owners and employees, for the past several years we’ve provided many opportunities for engagement year-round and especially during National Domestic Violence Awareness Month in October. These activities include providing materials to host supply drives, volunteer projects or fundraisers for domestic violence nonprofits, sharing educational content on social media about domestic violence and financial abuse, and writing notes of encouragement and support for a domestic violence survivor to receive when she arrives at a shelter. Last year, we continued to expand these opportunities to get involved, learn more and give back. For the first time, the Allstate Foundation Purple Purse nonprofits, the more than 200 domestic violence nonprofits that participate in our Challenge, were the beneficiary of the annual Allstate Good Life Sprint & Stride 5K Walk/Run in September. Nearly 2,500 Allstate employees laced up their gym shoes and participated in the one-day series of live and virtual events. Funds were raised through donations for branded t-shirts and event sponsors. We also invited a select group of passionate Allstate agency owners and employees to participate in our annual Domestic Violence Advocate Training to empower them to teach the Purple Purse Moving Ahead financial empowerment curriculum and deepen their involvement with a local domestic violence nonprofit. The Allstate agency force is passionate about inspiring change in their local communities. The Allstate Foundation recognizes these women and men for giving their time to nonprofits in their communities through $1,000 Allstate Foundation Helping Hands grants. Last year, nearly 900 agency owners volunteered with domestic violence organizations across the country, earning the nonprofits nearly $900,000 total in grants. Members of the agency force who are actively involved with Purple Purse are part of our Allstate Against Abuse team. Q: How does The Allstate Foundation measure success across its Purple Purse initiative? Our ultimate goal is to end domestic violence through financial empowerment. When we live in a healthy and safe environment free from abuse, we’ll consider we’ve achieved success. To get there, we have to break down the social stigma around domestic violence and get people talking about it. It’s been said that domestic violence thrives on silence, and we’re working to break that. To track our progress, we focus on programmatic goals, including funds raised to strengthen the capacity of domestic violence nonprofits, survivors served and domestic violence advocates trained to teach our curriculum to survivors. We also track program engagement, including the number of individuals we engage in our campaign each year, the number of Allstate agency owners and employees involved and supporting Purple Purse, and the number of new for-profit and nonprofit partners we recruit to join the movement. Q: How does The Allstate Foundation plan to continue the momentum and expand Purple Purse’s impact in communities around the country? What’s next to come? As Allstate Foundation Purple Purse evolves, we continue to search for provocative and innovative campaign strategies to engage the public and inspire them to think differently about this horrifying epidemic. Domestic violence touches the lives of those around each of us, and for too long, people have turned a blind eye to it. Last year, we created the social experiment film, “Lost Purse,” to give the public a glimpse into the life of a domestic violence victim when individuals found her lost purse in the back of a rideshare vehicle. It also explored the question, “what would you do if you had an opportunity to help a victim in need?” To date, the film has been viewed more than 12 million times. We’re building on the momentum from last year’s campaign to keep pushing domestic violence and financial abuse to the forefront, into dinner conversations and into people’s social media news feeds. Domestic violence isn’t a woman’s issue. It’s a human rights issue. All of us play a powerful role in creating a society free from abuse by modeling healthy relationships and behavior. We’re addressing prevention by funding nonprofits that are using innovative programs to stop the violence before it starts. For example, women who are between 18 and 24 years old generally experience the highest rates of domestic violence. To address this group, we’re expanding our partnership with the national women’s fraternity, Alpha Chi Omega, which focuses their philanthropic efforts on domestic violence. We’ve provided each chapter with training and resources to present a 30-minute Healthy Financial Relationships curriculum developed with The Allstate Foundation partner WE Charity. Also, we’re enlisting men to join the movement too. If men become aware of abuse, they can find ways to safely get involved and stand up for victims. They could help save a woman’s life. We’re currently supporting innovative programs like AMEND Together through the YWCA Nashville, which focuses on ending the epidemic of violence against women and girls by empowering young men and boys to become the catalyst for cultural change. While we’ve been leading the charge, we know we can learn from other companies and nonprofits. In 2018, we’ll host a group of nonprofit and for-profit organizations with a connection to the issue, to start discussions around working together toward long-term societal change. The Allstate Foundation was also the lead sponsor of the Impact Genome Project, a first of its kind reporting tool to create better data and standardized metrics to inform nonprofits and funders. The new tool will provide time savings for nonprofits’ final funding reports so staff can focus their time on serving more people and communities. It will also give nonprofits better metrics and more insight into how to optimize the effectiveness of their programs. For funders, like The Allstate Foundation, each nonprofit scorecard report collects powerful data into a centralized location that funders can use to make strategic funding decisions. For both funders and nonprofits, the insights will help ensure we’re all driving real sustainable societal change. Q: Are there any actions the public can take today to help end domestic violence? True social change will only come if we all – men and women – step up to create a healthy and safe society. If you know a woman who is trapped in an abusive relationship, give her the empathetic support she needs and deserves. Listen to her. Be there for her. Help her find the resources she needs to get help. Let’s stand up to abusers and stand up for survivors. Together, we can create a society free from abuse.